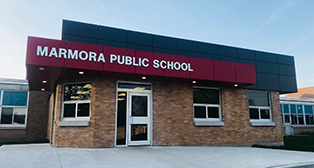 Marmora Public School, located in the village of Marmora just east of Hwy. 14 and north of Hwy. 7, serves 162 students from Grades JK to 8. 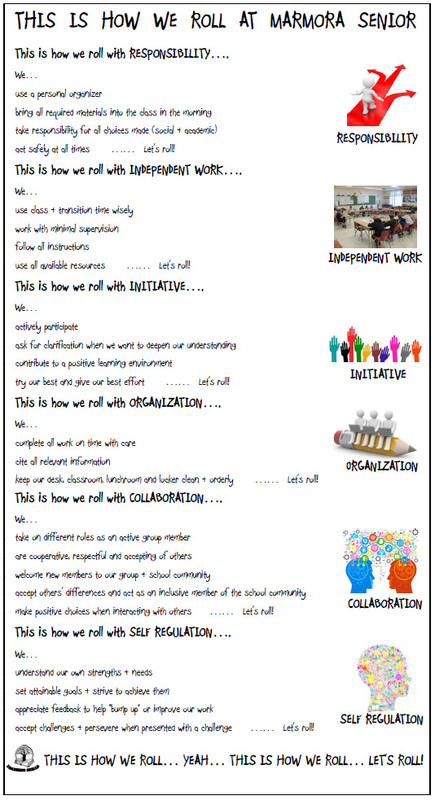 The mission of the Marmora School Community is to provide the best instruction and support for the development of literacy, numeracy and character skills for all school community members. The school has a multi-media computer lab, a library resource centre, a gym/auditorium and a student support resource room. Numerous academic and social activities are provided daily by members of the school community. Marmora PS students proceed to Centre Hastings Secondary School in Madoc for Grades 9 to 12.
for lunch. Students in Grades 4 to 6 must be accompanied by a parent/guardian when leaving school property during a nutrition break. Crossing Hwy. #7 (TransCanada Hwy): Parents/guardians are asked to consider whether or not they believe their child(ren) are capable of safely crossing Hwy. #7 without a traffic light, cross walk or crossing guard when giving consent for their child(ren) to leave school property during the 2nd Nutrition Break. Your note must specify your child has permission to cross Hwy #7 independently and name the destination/place where your child has permission to purchase and eat his/her lunch. Only students with parent/guardian permission to cross the highway may cross. This is to ensure parents/guardians are fully aware of the risks and have given consent. Special Food Days: Let’s work together to have our students participate in Special Food Days on Fridays! Every Friday, at the second nutrition break, students have the opportunity to eat pizza and subs delivered to the school. Does it get any better than this? We ask that parents/guardians support this fundraiser as it supports student activities and offers a lunch alternative at the school . Check out the monthly calendar. To reduce the risk of exposure to allergens that pose the risk of a life threatening reaction, your support in not sending or bringing foods, snacks and treats that contain peanut and nut allergens into the school environment is needed. Attention Grade 7 and 8 Students & Parents! Struggling with Math? How about having access to a free online tutor? All students in Ontario that are currently in grades 7- 10 now have access to free online math help. Students & Parents: How do I register? Teachers: How can I register my class? Teachers: Where can I find out more information?